The British Invasion went by the code word, "Beatlemania". After the Fab Four appeared on the Ed Sullivan Show in 1964, North American music was never the same! Across the Pond celebrates over 50 years of British pop and rock music. You'll hear hits of The Beatles, Dave Clark Five, Herman's Hermits, Elton John, Petula Clark, Tom Jones, Queen, The Rolling Stones, Shirley Bassey, Gerry & the Pacemakers, The Animals, Dusty Springfield, Rod Stewart, Adele, Eric Clapton, Van Morrison, Sting, Annie Lennox, Led Zeppelin, Joe Cocker, Lulu, The Hollies - and more! 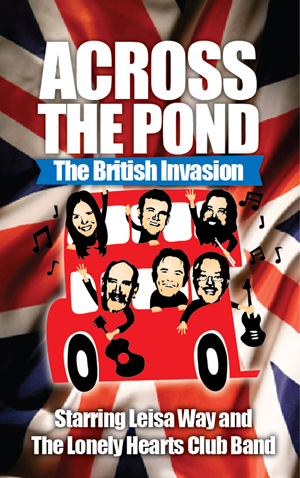 "Across the Pond: The British Invasion ended with a well-deserved standing ovation".